A BBC series is asking some of the world's most influential people about the defining moments in their life. 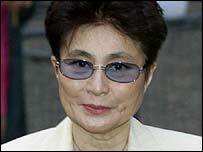 Yoko Ono became one of the pioneers of performance art after she moved to America from her native Japan. After she married John Lennon in 1969 she became better known as the woman who broke up the Beatles. She has continued a solo career since the 1970s. During the war I was in Japan and one day there was a radio programme where the soldiers who were the Kamikaze pilots. Before they were leaving they were allowed to say something on the radio to their parents or family. And they all said: "Mummy, I'm going now and I wish you a long life," or something like that. It was just the most horrific thing that I've heard and I'll never forget that, I'll never forget that. What an incredibly cruel thing to do to any human being. I think that changed my whole idea about war. I was a young girl so I really didn't know what war was, except that it's very frightening. And every night I had to go into a shelter when the bombers came overhead. But just the cruelty of that was too much, I thought. There was nothing noble about the war. I mean, there was propaganda in both countries I'm sure, saying "It's a noble war, we have to do it", or something like that. But when you get down to that then you know it's cruel and totally wasteful." Defining Moments will run until 23 July on BBC World Service's World Today programme. You can also read people's recollections on BBC News Online. "It was just the most horrific thing that I've heard"